The 2010 Escape To Wisconsin Road Rally took place on Saturday, April 17, 2010 in St. Croix and Pierce counties on the western edge of Wisconsin. The event was hosted by the Alpha Romeo Owners Club (AROC). 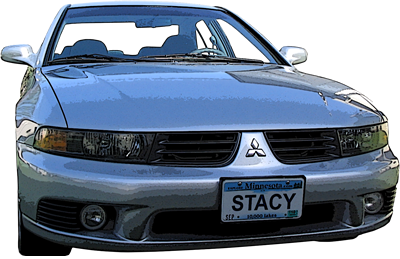 This type of road rally is intended to provide a fun country drive along with some basic rally challenges. The route began in Hudson, WI with the halfway point at Ellsworth, WI and finished in Woodville, WI. It covered a total of 108 miles, took about 3:20 hrs and averaged around 32.5 MPH, including all stops. This was a Time Distance Speed (TDS ) event with prescribed start/arrival times, distances and speeds. The object is to arrive on time at each ECZ, not too soon or too late, otherwise points are levied. It is not a race, but sometimes you need to make up time if you become delayed. Cars should be able to stay well within the speed limit. You depart from the BCZ at the given time according to your clock, drive a specified distance to each control point at the specified average speed or CAST until reaching the ECZ, where a worker hands you a time slip. The correct course at each intersection is determined by applying the following priority list in the order shown. 1. Proceed as directed by the numbered instruction. 2. Leave the intersection on the paved road. 3. Proceed as straight as possible. The class we entered was D/HD, stock - novice (no special equipment or experience). We used a digital clock that displays seconds and was synched to the event master's official time. I picked one up at Walgreen's for $12.99. You need a clipboard, pencils, and a calculator can come in handy. A compass was not required at all with this type of event. Each checkpoint zone is just a short distance within each leg. You are only timed between the BCZ's and ECZ's. The length of each zone averaged 1.7 miles and that was the only segment on the leg where you had to maintain the specified average speed or CAST. It didn't matter if you arrived early at the BCZ, as long as you departed at your correct time and maintained average speed. Turns out, I incorrectly synched our clock and was off by a full minute on almost every leg... woops! Toward then end of the rally we compensated for the lost minute and were able to make an ECZ within :00.02 minutes (or 1.2 seconds). Subsequently, we finished last. Our hosts told us told we did well as beginners by not getting lost the entire trip. There was a Jaguar that dropped out. 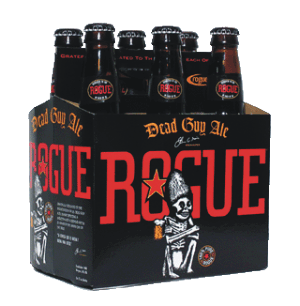 However, we won the booby prize for dead last... a six pack of Rogue Dead Guy Ale. Deb was an great navigator and read all instructions perfectly. We only made two wrong turns but were able to correct course quickly. It was a lot of fun and Deb can't wait to do it again! Event took place in Pepin and St. Croix Counties in western Wisconsin. Begin odo check at "25 M.P.H." End odo check at "STOP AHEAD". BCZ 2 at stop. CAST 35. Left at stop. (CAUTION!) ECZ. BCZ 3 at curve arrow. CAST 36. BCZ 4 at "35 M.P.H." CAST 40. Left on SPRING GREEN NO. 3. ECZ. BCZ 5 at curve arrow. CAST 36. BCZ 6 at curve arrow. CAST 40. BCZ 7 at "NARROW BRIDGE". CAST 40. BCZ 8 at "HILL". CAST 36. BCZ 9 at squiggly. CAST 36. BCZ 10 at "HILL". CAST 40. BCZ 11 at squiggly. CAST 36. BCZ 12 at stop. CAST 40. Left on OLD CTH B.
Wildwood Bar and Grill - Woodville, WI THE END! The prize for "dead last"